If there is one thing our barbaric corrupt political class have in common from Ireland to Australia is the need when to keep us divided through the carrot and the stick. There weapon of choice is often whipping up of division, scapegoating of minorities and fear of the ‘other’. 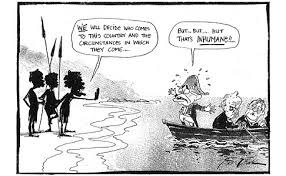 In the case of Australia, which I have learnt to well since arriving on these shores, it is the spectre of ‘boat people’ or asylum seekers which dominates the mainstream political discourse in terms of the forthcoming elections. Basically two shades of the same political establishment seek to outgun each other to see who can offer the cruelest form treatment for men, women and children fleeing persecution, hunger and oppression. You don’t need to dig deep beneath the surface to expose this racist and state sponsored terrorism which has tragically resulted in at least 1376 refugees drowning while trying to reach Australia since 1998. Behind every statistic lies an individual story and a family tragedy. Behind the hysteria of ‘queue jumpers’ and ‘crime influx’, the reality is Australia takes less that 1% of the world’s refugees, people often fleeing conflicts and military occupations created by western imperialism such as those in Iraq and Afghanistan. For the vast majority of refugees there is no queue to join, especially when you are offered the choice of life and death. In an attempt to outgun the Labour Party and its ‘PNG Solution’, Tony Abbot, Catholic fundamentalist educated at Oxford and leader of the opposition claims he will completely stop permanent residency and use the Navy to stop the boats. In this he is following in the footsteps of his predecessor, Thatcherite John Howard. This casual racism is something I have particularly noticed on the job and among family in terms of hostility to ‘asylum seekers’ and general fear of the other. While like any ‘community’, the Irish- Australian community is not one monolithic identity, I was struck, but to some extent not surprised, that many first and second generation have quietly assimilated into the colonial context of Australia. All too eager to fly the flag on Invasion Day on the 26 January while forgetting the similar circumstances which forced hundreds of people to flee Ireland due to oppression and poverty which continues to this very day in the form of economic migrants. The other side of the story is an active refugee support movement that has gained some traction in recent months in terms of organising and mobilising, as well the eruption of riots and burning down of some camps. Without forging real solidarity and having these discussions with your workmates and neighbours empathy and compassion can only sustain a movement for so long. In the face of largely indifference from the wider population and a colonial mentality from the political class, a class based movement must come to the forefront placing the needs and interests of people escaping persecution. While billions continue to spend on military conquests, border security and detention centres that could be better spent of alleviating poverty, job cuts and healthcare we see the interests of the profit come before people. Until we remove this cancer, refuge will always be one option and for many their only hope. In this regard Irish workers should clearly know what side of the fence they stand on. 1% of the worlds refugees are resettled AT ALL, EVER, by anyone. The proportion of refugees resettled in Australia is 0.009%. So yes, substantially less than one percent. I'm not sure where you got the figure for the number of people who have drowned in Australian waters while seeking asylum, but it conflicts with others I have read. To the above commenter, please don't just make things up, hyperbole just makes the task of arguing against the current regime in Australia all the harder. As at 31 December 2012 there were an estimated 45.2 million people displaced, of whom 10.5million fall under UNHCR mandate (Palestinians and internally displaced persons are outside it's purview). In 2012 Australia hosted 30,083 refugees under UNHC mandate, or 0.29% of the UNHCR mandate. Australia received 29,610 applications for asylum in 2012, which represents 1.47% of a world total of 2,011,334 new applications in 2012.